Enrollment begins January 8th for the 2019-20 school year! Wesleyan Preschool is a nationally accredited preschool program that offers a rich curriculum based on a sound knowledge of child development and guided by the Developmentally Appropriate Practice set forth by the National Association for the Education of Young Children. Our program takes a child from “learning to love” to a “love of learning.” Our objectives are for children to feel loved and comfortable in their environment and to learn to accept responsibility and show respect for other and themselves. Our curriculum and room arrangements promote large and small motor skills, social and emotional growth, positive conflict resolution, and intellectual development. We offer a full preschool curriculum that includes activities in language arts & literacy, math, science, dramatic play, sensory and water tables, movement and music. We emphasize “freedom with limits and rights with responsibility.” Limits are non-judgmental and enable children to respond to guidance without shame or resentment. In this way, children develop inner-control as they grow toward healthy independence and responsible individuals. Children need to develop feelings of trust, security, and confidence before they are free to explore, create, and discover. We emphasize helping children express their feelings and needs in acceptable and appropriate ways. We strive to teach children the necessary skills for developing relationships. We validate the children’s feelings and needs with love, joy, and lots of hugs. Our emphasis on intellectual development helps children function independently; initiating activities, making choices and following through on decisions. We help children express themselves by finding the words to describe what they are doing. In this “hands-on” approach to learning, we utilize those activities the child is involved in and teach concepts through the immediate experiences. 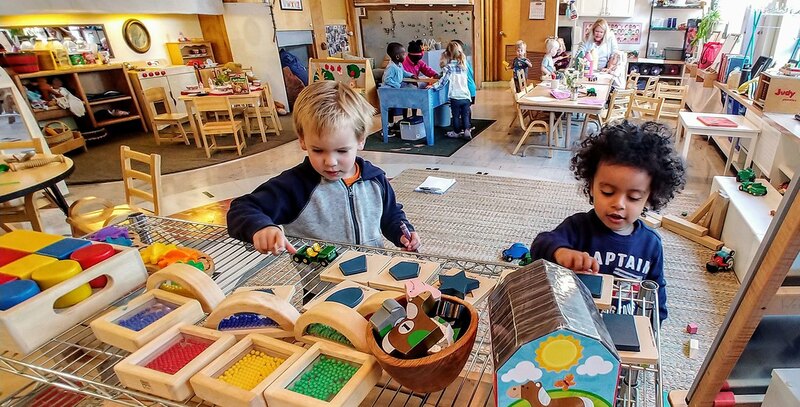 The Wesleyan Preschool encompasses more than “just play.” A sequential program with an emphasis on literacy in conjunction with a wide variety of activities help to provide a concrete basis for school readiness and future success. Our staff works with each child in a warm, positive manner so they will leave Wesleyan with increased confidence and a greater empathy for others. Wesleyan is a ministry of the First United Methodist Church of Boise, Idaho. Together we will navigate these precious early childhood years supporting your child’s natural curiosity and desire to experience the world around them. We will encourage and nurture each child individually, facilitating all aspects of development; cognitive, emotional, and spiritual. We will strive to instill in each child a love for learning and a deep respect for all God’s creation.